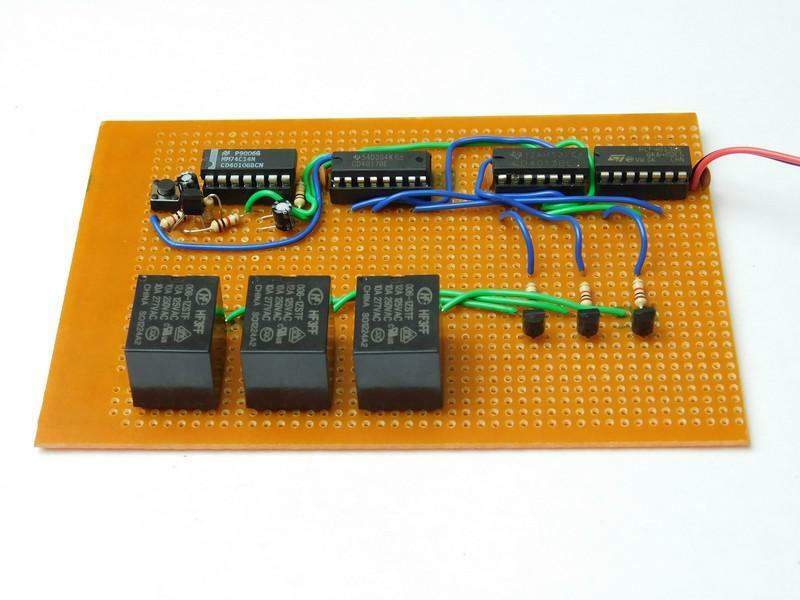 This simple power sequencer is ideal for large voltage and current switching for CNCs. With the increasing complexity of ICs, power sequencing is something that even hobbyists will need to learn. 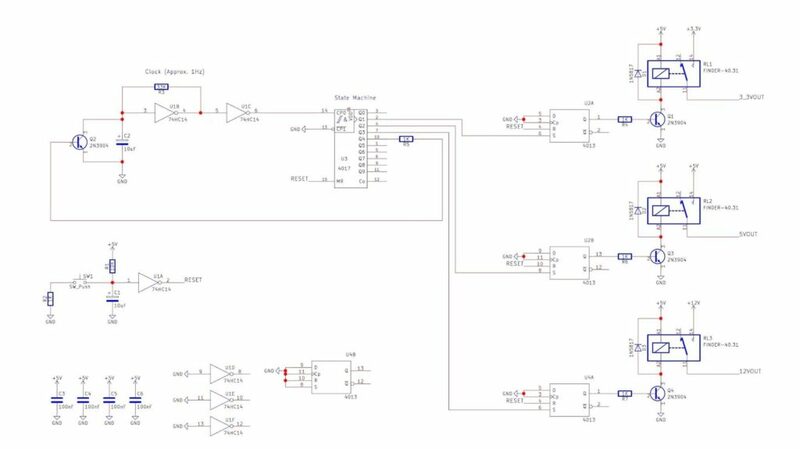 Many methods for power sequencing exist, but, in this project, we will look at a simple power sequencer that is ideal for large voltage and current switching for CNCs. Before we look at how this circuit works, it is first important to understand what power sequencing is and why it is important. Many ICs on the market use single supply rails, with the two common voltages being 5V and 3.3V. However, some devices (and these are increasingly common) require more than one rail (such as CPLDs that use different I/O and core voltages) and it is imperative that these voltages are supplied in the correct sequence. For this project, let us look at the most common hobby CNCs on the market, the 3020 and 3040. These CNCs are very adequate for hobby use, but they are based on an old design and suffer a fatal flaw that can result in permanent damage. The controller uses a very common stepper motor controller called the TB6560, which is produced by Toshiba. Now, many Chinese controllers (including the 3020s controller) use a single input supply to the controller, which is first regulated down to 12V and then this is further regulated down to 5V using the 7812 and 7805, respectively. Since the incoming supply usually connects to the TB6560's motor power pins and the 5V connects to the TB6560s supply voltage, the motor power pins will be powered before the supply pin is. However, the datasheet for the TB6560 clearly states that the supply pin must be stable before the motor power is enabled—otherwise, internal short circuits can occur. 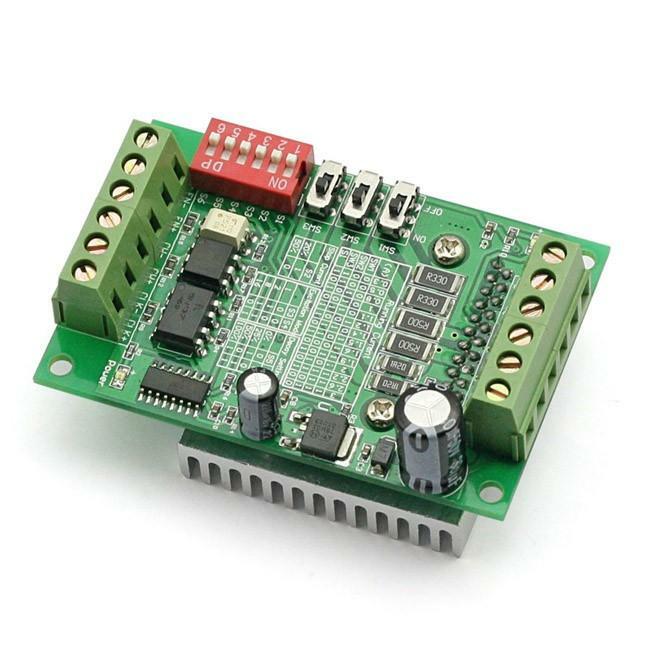 Therefore, if you have a TB6560-powered CNC controller and you see a 12V regulator and 5V regulator, you are better off taking these out and replacing them with a proper external power sequencer that will turn on the 5V rail first, then turn on the 12V supply, and then the motor supply. So, the circuit consists of a simple 4017 counter, an oscillator (U1B), and several flip-flops. The device that requires power sequencing is connected to the normally-open connectors on the relays and the three relays shown here control 3.3V, 5V, and 12V, but these could be any value you want. When the circuit is first turned on, C1 will be discharged, which will result in U1A having an output of 5V. Since this is connected to all reset pins in the circuit, the 4017 and the 4013 flip-flops will all reset to a known state. This is needed to ensure that all the relays stay off on start-up and that the 4017 will start counting from 0. Once C1 charges, the output on U1A will switch off, and this allows the circuit to run. The Schmitt trigger U1B is configured as an oscillator with a frequency of approximately 1Hz, but this frequency can be changed (just ensure that the relays can switch fast enough). Each rising edge of the oscillator causes the 4017 to increment its output and the outputs 1 to 3 all trigger flip-flops. When these flip-flops turn on, they stay turned on and they also enable their associated relay. As the 4017 counts to 4, it turns on Q2, which prevents the oscillator from oscillating and thus the circuit remains in a steady state, enabling power through the relays. This circuit only provides power on sequencing, but if power down sequencing was needed, then the 4017 outputs could also be connected to the RESET pins on the 4013, which turns them off and thus turns off the associated relay. When you power the circuit, hold down the reset switch (SW1), and when you release it, you should hear three ticks (one from each relay). 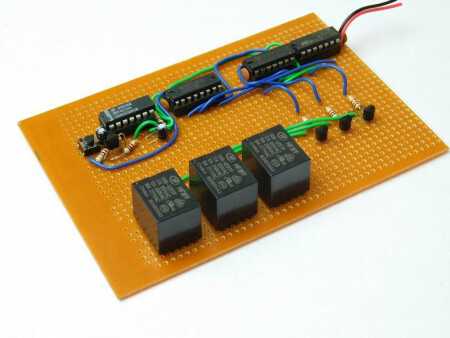 This circuit can be made using many different circuit construction techniques including stripboard, matrix board, breadboard, and PCBs. However, extra care should be taken on the relays, because if large loads are to be connected (such as CNC motor supplies), then larger wires or traces should be used. The circuit shown here has been made on stripboard, but a more permanent version would be made on a PCB and then fixed into a project box with IO connectors for input and output power lines.